Carolina R. Buitrago has been an EFL teacher for over 15 years. She holds a B.A. in ELT from Universidad Pedagógica Nacional in Colombia, a certificate in English from Mount Holyoke College in the US and a Master’s degree in Educational Technology and TESOL from the Universtiy of Manchester in the UK. She currently works as a full time professor at Institución Universitaria Colombo Americana -UNICA- and as a lecturer for the Master’s program in English Language Teaching for Autonomous Learning Environments at Universidad de La Sabana in Chía, Colombia. 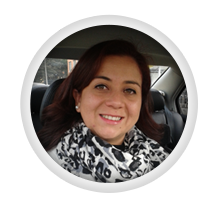 Carolina has spoken at different national and international conferences including COPEI in Ecuador, ELT conferences in Colombia, and TESOL International. She has also worked as an associate editor of the Latin American Journal of Content and Language Integrated Learning (LACLIL). Carolina has co-written teacher training materials for the Ministry of Education in Colombia. Recently, the Department of Foreign Languages and Cultures at Universidad de La Sabana won the BETT Education and Technology in Higher Education Award at the BETT LATAM Leadership Summit 2015 because of theproject: “Flipping English learning, improving our 21st Century Colombian learners’ outcomes through technology and autonomy” led by Carolina Rodriguez Buitrago and Juliana Diaz.